You (literally) won’t get anywhere in Thailand without knowing all about songthaews! What’s red, speedy and your best friend on the street? The songthaew, of course! 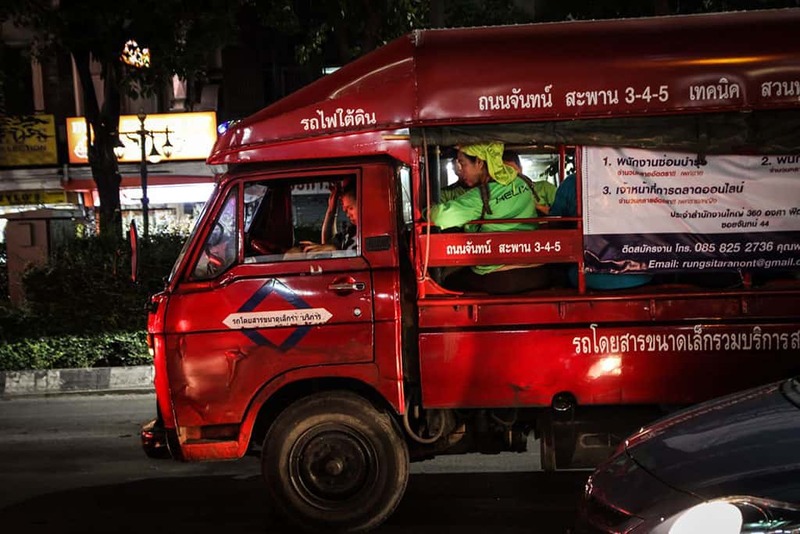 These shared transport trucks are the workhorses of the Thai transport system, covering larger distances than tuktuks and getting you around faster than the local buses. We’ve put together a guide all about songthaews to acquaint you with these kings of the road. Pretty much wherever you are in Thailand, you’ll encounter the red songthaew trucks. They’re the country’s fill-in between the small, zippy tuktuks that whizz around the towns and cities and the much larger minibuses and buses that travel between cities. The word ‘songthaew’ literally means two rows and refers to the seating arrangements in the back. The driver sits in a cab at the front, and passenger access is solely through the open back door. Two bench seats line the back of the truck and you’re expected to jump in quickly and squeeze onto one of the benches facing the passengers on the other side. Cue lots of bumped knees and squished luggage if you happen to pick a full one! Don’t worry, it’s all part of the fun though. You can have your songthaew three ways! There are two different kinds of songthaew operating across the country, and it’s pretty important to know which is which otherwise you might be stood in the road waving your arms around for a while! The first is the type that service places like Phuket and Pattaya. These follow a set route, like buses, and will have signs on the front telling you where they’re going. If the sign is in English then so much the better! You simply flag one down, jump in and press the buzzer when you want to get out. Learning a few Thai phrases will help in situations like these, trust us! The second type of songthaew is seen in places like Chiang Mai, and will alter its route depending on who it picks up. These are a bit more flexible so you don’t have to be stood on a set route to find one- just make it clear to the driver that you want to get in, then let them know your destination. The driver might say no if everyone else in the back is going a different way to you, but they’re generally pretty good at finding clever ways to accommodate all their passengers. But wait, what’s the third type of songthaew? Well, it’s hiring either of the first two types for exclusive use! If you see a songthaew parked up then you can go chat with the driver. If he fancies doing a private transfer then you’re in luck. Obviously you’ll have to pay for the privilege but with standard fares starting from about 20 baht ($0.70), but it’s incredibly convenient if you’re short on time. But since you’re reading this on good old Bodega’s blog, you’re probably spending most of your baht on drinks and adventures anyway. Luxury travel trends? Pass! Is it all good, all the time? Songthaews are great, but just be aware that there are no seatbelts in the back, and no safety precautions taken with passengers. Granted you likely won’t be traveling long distances in one but it’s just something to be aware of if you’re a bit nervous of the sometimes crazy traffic situation. There have also been isolated reports of pickpocketing in Bangkok songthaews, but these are few and far between and by and large they are a brilliant and safe way to get around. But everything else about songthaews is pretty much all good! Making friends with the humble songthaew will help your trip go that much smoother. Want to visit that waterfall but don’t have a scooter? Grab some buddies and hire a songthaew. Want to get back from the bar drunk at 4 in the morning? Songthaew to the rescue! They’re a social, cheap and quick way to get around. Wave one down and enjoy the ride.